When you decide to lose weight, you want results now. Those results keep you motivated and on track. But fast weight loss has diminishing returns. What you gain in satisfaction in the short run is usually paid back with weight regain and an ultimate surrender of your goals when you go off an unsustainable diet. A safe, sensible weight loss as defined by the Centers for Disease Control and Prevention is up to 2 pounds per week. For many people, even this rate may be too aggressive in terms of dietary and exercise modifications, and they may have to settle for a 1/2- to 1-pound-per-week rate. Recognize that regardless of the speed at which you slim down and tone up, you're doing a world of good for your body. Calories are the name of the game when you're trying to lose weight. Eat fewer calories than you burn, and the scale will respond. A 3,500-calorie deficit means 1 pound lost. A simple 500- to 1,000-calorie-per-day deficit equals 1 to 2 pounds per week, assuming you can muster enough energy and will power to do so. Your calorie needs -- which you can figure using an online calculator -- depends on your size, age, activity level and gender. From this number, which represents how many calories you need to maintain your weight, you create a deficit with diet and exercise. For most people, a diet of 1,400 to 1,600 calorie per day is a low intake. As a general rule, you don't want to drop below 1,200 calories consumed daily on a regular basis. This small number of calories can lead to nutritional inadequacies and loss of muscle mass that stalls your metabolism. Eating too few calories to prompt quick weight loss is contrary to your goal of toning up. 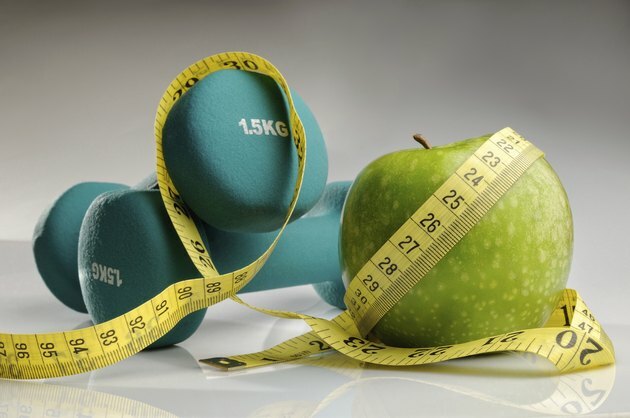 The best way to create a calorie deficit to slim down and tone up is to combine diet and exercise. A study published in Obesity in 2012 showed that lifestyle changes combining diet and exercise promoted the greatest change in body weight and fat levels in postmenopausal women. For young women and all men, this method is quite effective, too. Fad diets that propose you subsist on juice or minuscule portions of food daily aren't your best option. You may experience quick results, but the regimen is so restrictive that it's unlikely to stick. Losing at a rate faster than 3 pounds per week after the first couple of weeks also puts you at a greater risk of developing gall stones. Skipping meals can leave you feeling extraordinarily hungry so that you binge at the next opportunity, causing weight regain. Instead, plan for three meals per day and, optionally, one or two snacks. Your portion sizes at meals depend on your daily calorie intake allowance but will contain lean protein, whole grains and vegetables. Fill your plate with about a quarter each of whole grains, such as wild rice or barley, and a lean protein, such as grilled chicken or broiled shrimp. Fill the rest of your plate with low-calorie, fibrous vegetables, like leafy greens. Losing fat and retaining, or building, muscle create a strong, toned appearance. If you create too large of a caloric deficit, your body may dip into your lean mass stores to find fuel. You'll lose the valuable muscle you want to grow and maintain. A paper published in a 2006 issue of Sports Medicine notes that losing lean muscle mass while trying to reduce calories hinders the entire weight-loss process. Counter the loss of muscle by boosting your protein intake as you create a total deficit in calories. Protein-rich but weight-loss-friendly snacks include cottage cheese, hard-boiled eggs, deli meat, low-fat cheese, Greek yogurt, canned tuna and whey protein powder. Cardiovascular exercise helps you trim down by burning extra calories. Go for at least 250 minutes per week of moderate-intensity work, such as brisk walking or swimming laps. Although this work will help you shed excess fat and strengthen your cardio-respiratory system, it won't build the tone in your muscles that you're after. Strength training helps you become leaner and stronger. Even if you're not after a bodybuilder's physique, you still need to hit the weights. Train all of the major muscle groups at least twice per week with one set of eight to 12 repetitions at a weight level that feels challenging but doable. Once a series of 12 repetitions feels easy, increase your weight and number of sets. Rest 30 to 60 seconds between sets. Choose multijoint moves such as squats, presses, pulls and lunges to work the greatest amount of muscle and burn the most calories at each workout. Building muscle also increases your resting metabolic rate. Leave at least 48 hours between working specific muscle groups to allow for recovery and repair. Changes in your muscle's appearance don't happen overnight. It may take several weeks, or months, to notice significant changes in tone. Can You Lose 45 Pounds Quickly?